Shopping for Captain America Pop! Vinyl Figures? 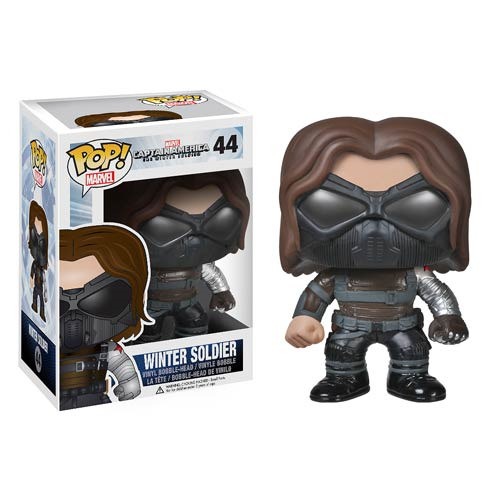 Sebastian Stan's Winter Soldier from the blockbuster Marvel movie Captain America: The Winter Soldier gets the Pop! Vinyl treatment with this imposing looking Captain America The Winter Soldier 2 Movie Winter Soldier Pop! Heroes Vinyl Bobble Head Figure! Standing 3 3/4-inches tall, the figure finds Sebastian Stan's Bucky Barnes in his Winter Soldier suit with the red star on his left shoulder and stark black mask covering his face. Pair him with the Black Widow Pop! Heroes Vinyl Bobble Head Figure (sold separately) for a cool display! Ages 5 and up.